The Foundation last renovated the building in 2010–2011, restoring the historic exterior, and completely upgrading the interior for vacation rental accommodation. The result is a comfortable small cottage located at the edge of the Niagara River, with views to Fort Niagara (New York) and beyond across Lake Ontario. The accommodation provides a ground floor living/dining space with fireplace and TV, a fully modernized 3 piece bathroom, and a kitchen. 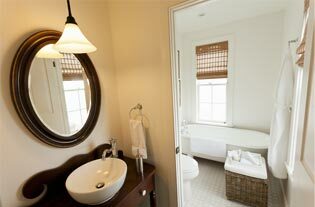 The upper level has a small sitting area, bathroom and lush bedroom overlooking the lake. The décor was designed by a professional designer who is a member of this Board, and the attached photos attest to the success of this renovation, in providing a comfortable, relaxing and historic getaway. Sunrise across the river; sunsets across the lake! 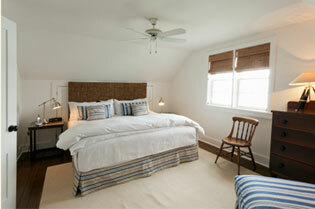 The minimum stay is 2 nights – $425.00 per night plus HST (Winter season rate $250 per night from November 1 – March 31). Five nights – $1,950.00 plus HST and a week –$2,700.00 plus HST. Call 905.468.1950 or on-line at niagaraonthelake.com.